Today, a friend of mine, Michael Graves, spoke at the Kansas Book Festival. At the festival he received a 2016 Kansas Notable Book Award for his book “To Leave a Shadow,” which is a fun read, a detective novel set in 1937 Wichita. 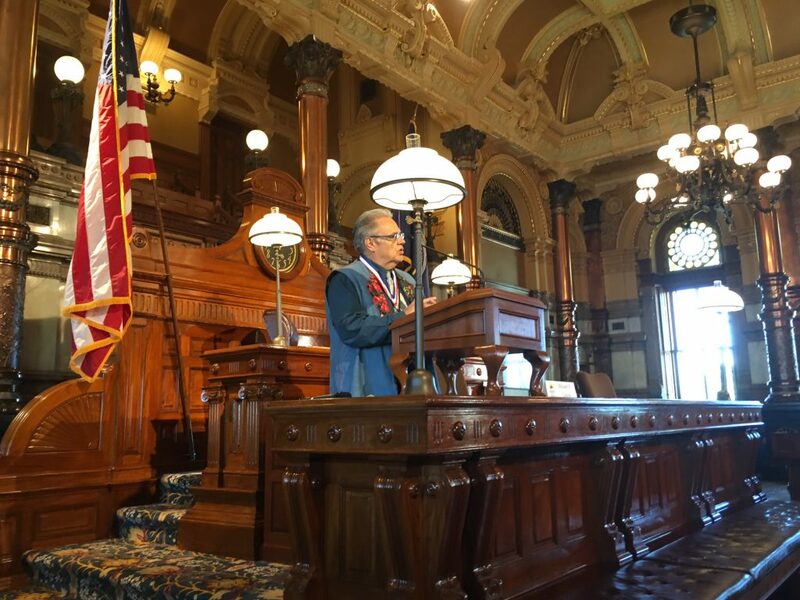 His talk was in the Senate Chamber of the Kansas Capitol building in Topeka. And, since the recent restoration of the Capitol, the building is just gorgeous. The Senate Chamber is stately and magnificent. The chandelier globes came from Czechoslovakia and each globe has 34 stars as Kansas was the 34th state. So, quite an attention to details. Mike said, “I haven’t forgotten my grandfather, but I didn’t know much about him.” This book gave Mike the opportunity to research the time and place where his grandfather had lived. Mike told about trips he and his wife, Monica, made to Wichita to do historical research. He said they were at coffee shop in downtown Wichita where he looked off across the street and saw that the words at the top of that building said “Lawrence Block.” And in real life, Lawrence Block is one of his favorite writers, so Mike took that as a sign that his private investigator character, Pete Stone, would have had his office in this building back in 1937. Mike and Monica also stopped at a sandwich shop, Merle’s Place, in the 400 block of N. Seneca. While there, they learned a bit about the history of the cafe, which had originally opened in 1935, two years before his novel takes place. The original owners of the restaurant were Tom and Fern Ioup, and the establishment was called Tom’s Place. Mike’s private eye needed a landing place to drink and eat, and he needed a friend to talk to, Tom, so Mike decided to use that place in his novel and called it Tom’s Inn, which was its name in 1937. On a visit to the Wichita-Sedgwick County Historical Museum, he and Monica saw a Jones Roadster on display. He car appealed to Mike, so he decided to have P.I. Pete own one. The car was appropriate to the time period, so Mike wrote into the story that Pete had received the car in payment for services on a prior case. For me, as a writer, I loved listening to Mike tell where so many pieces of his novel came from, how rooted his story was in time (1937), and place (Wichita). Having read his book, hearing those details was fun for me – and inspiring. I loved hearing about his process, how he found specific locations to put into his novel, and how he used that novel to honor his grandfather in his own way, to show that he hadn’t forgotten the man. While listening to Mike Graves speak to the audience, I felt the surge of creativity rise in my body. I wanted to write right then, to pull my own ideas out of the air, to put them onto paper, and to publish another book. Simply being in that space in which another writer speaks of his creative process raised my creative energy level. This is why it is so valuable to hang out with other writers, to hear them talk about their writing process, to learn how they see something and turn it into an idea or a setting, or turn a person they see or know into a character. When we hear others talk about the writing process, it helps us believe that we, too, can do this, that we,too, can write our own book. We can feel the energy flow off of other writers. And we can take that creative energy and apply to it our own ideas. Energy is shared. Learning about another’s path can lead us to our own path. If you’re a beginning writer, hang out with other writers. Ask them if they’ll share some of their process with you. Join a writer’s group. Find others who share your love of words and your love of storytelling. Find your tribe. To Leave a Shadow by Michael D. Graves is published by Meadowlark Books (Tracy Million Simmons), Emporia, Kansas.